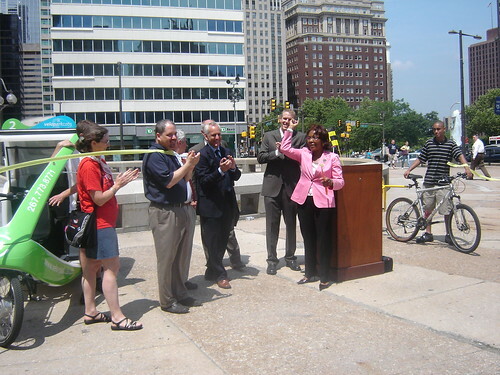 The Philadelphia Bikecab Allliance and Councilwoman Blondell Reynolds-Brown held a ribbon cutting ceremony launching bikecab service. The two founding companies Chariots of Philly and VeloPark plan to have more than a dozen bikecabs running this weekend. Bikecabs are regulated by the Streets Department and the Bikecab Alliance was formed to assist member companies to comply with regulations and to build a positive relationship with the community. But the overly cautious regulations set for bikecabs shows that proponents had to give up a lot for passage. Bikecabs for example cannot operate at night, when buses are scarce and taxicabs are in high demand. A look at the map shows that most of the ideal places for bikecabs to operate are off limits. This includes all of Old City, much of the historic district and the stadium area. This service would be a welcome link for the half mile plus trip from the Broad/Pattision subway stop to Lincoln Financial Field (and you wonder why more people don't take the train to Eagles games). One reason cited for banning bikecabs on certain streets is that they impede traffic, but this tie up on 3rd St in Old City ended shortly after a Duckboat Truck (top center) turned right. At less than 5 feet wide bikecabs are about foot narrower than cars and can be easily passed on most of the neighborhood's major streets.